Duck eggs are higher in protein content than chicken eggs and have a greater concentration of iron, potassium, vitamin E, B12 and D, but also contain more fat (see nutrition facts). Cooking with duck eggs isn’t much different than chicken eggs however, the yolks of duck eggs have more fat and the whites more protein than those of chicken eggs. You need to take keep this difference n mind when cooking. Somewhat gentler cooking is the key. To learn more about cooking with duck eggs see our Duck Egg Recipes. Our duck flocks are housed in a Free Run barn and we endorse and practice the same principles of humane handling and environment for all of our livestock. Produced by Free Run ducks. Higher in protein content than chicken eggs. 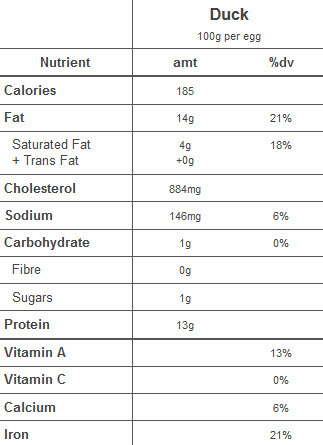 Greater concentration of other nutrients – iron, potassium, vitamin E, B12 and D.
Unique flavours and cooking attributes. Prized for use in baking, their richness produces moisture, fluffier baked goods, incredible cakes and cookies. Noodles made from duck eggs are chewier and crispier when fried or baked.